This page describes how to edit the dashboard title, settings, or individual tiles — and how to delete a dashboard. 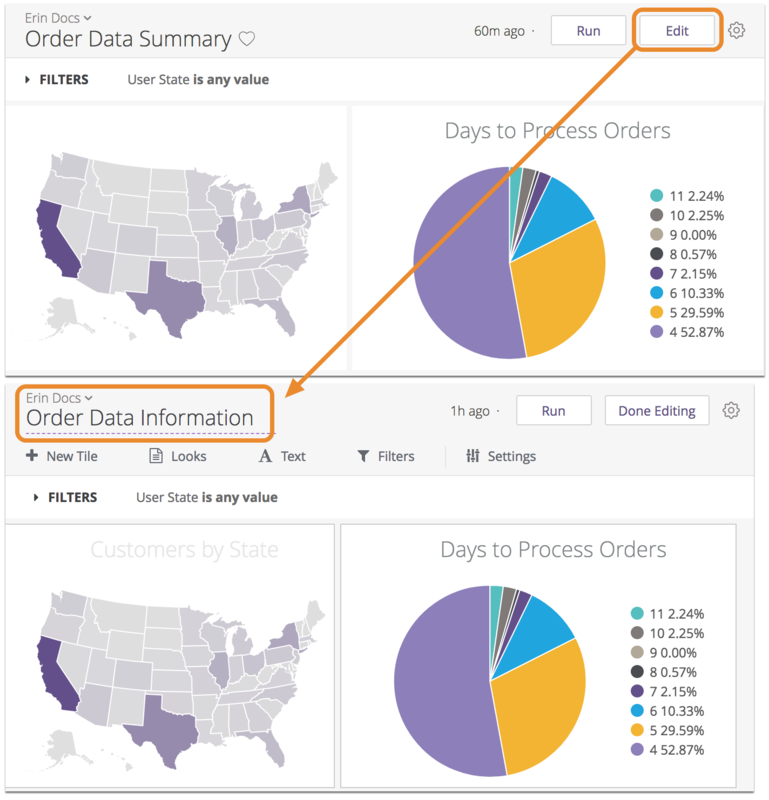 To learn how to create dashboard filters, see this page. Click Done Editing to save your changes. When the dashboard is in edit mode, you can make changes to a dashboard’s individual tiles. Click the Edit button at the top right of the dashboard to access the edit options for the tiles on the dashboard. For information on adding new tiles, Looks, and text to your dashboard, see Creating User-Defined Dashboards. If you save changes to a Look, it will affect every dashboard where that Look is used. Enter the text you want to show on the tile. Select whether to have the text appear at the top of the tile, the bottom of the tile, or as hover text that appears over a question mark icon that is added to the tile. Leaving this box unchecked causes the text to be centered in the tile, and to only show the beginning portion of the note with an icon to expand the full text. Checking this box will cause the entire note to appear, justified to the left side of the tile. 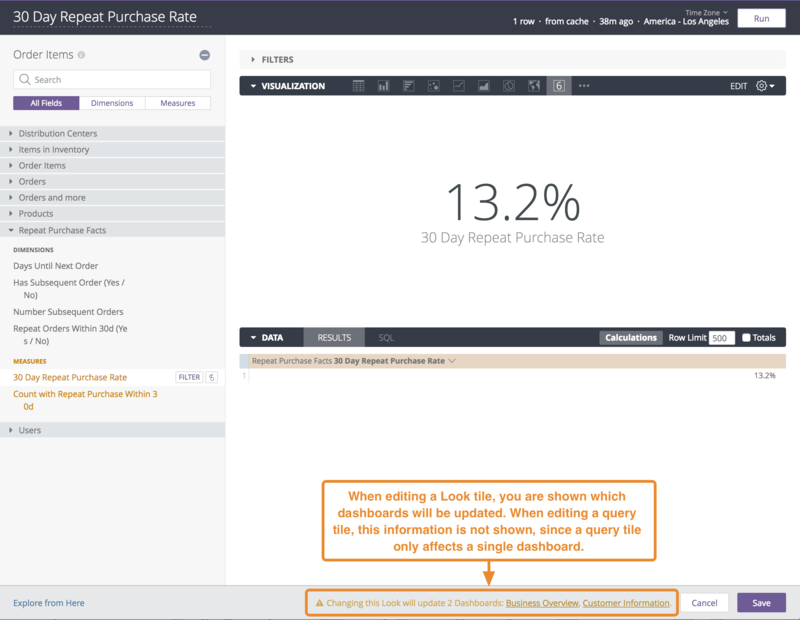 You can create a query directly from the dashboard without saving it as a Look. This helps avoid the potential clutter of having many saved Looks that are only needed for a single dashboard. If your dashboard has a tile that is based on a saved Look, you can convert it to a query-based tile. The Look is used in another dashboard. The Look is marked as a favorite. The Look is scheduled for delivery. If any of these are true, the Look will not be deleted. Discover creates a copy of the tile with the same query and visualization settings and adds the new tile to the bottom of the dashboard. 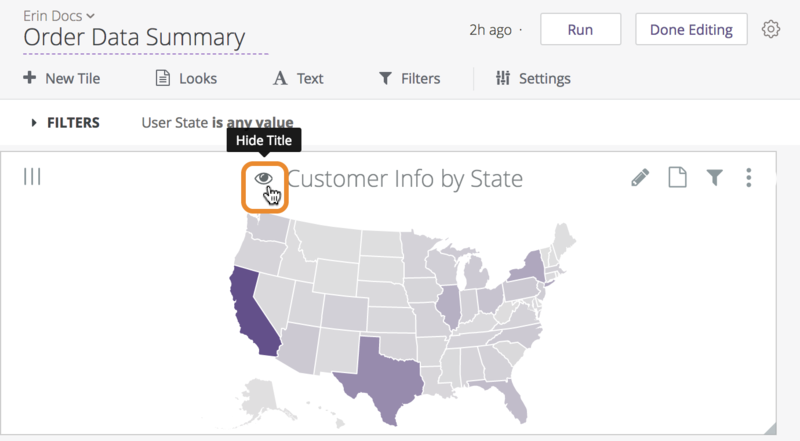 From here, you can edit the tile to adjust the name of the tile, the visualization, or the underlying query. There are two ways to remove tiles from a dashboard while in edit mode. To remove a single tile, use the gear menu on that tile and select Remove. To remove one or more tiles, check the box on that tile while in edit mode and choose Delete Selected. For Look-linked tiles — tiles that are based on a saved Look — click on the tile’s gear icon and select Remove. Because this type of tile is actually a Look that is being linked into the dashboard, the Look will still exist once it’s removed from the dashboard. For query tiles and text tiles — tiles that are created directly from the dashboard and are not saved elsewhere — click on the tile’s gear icon and select Delete. Since these types of tiles aren’t based on a saved Look, you are deleting the tile completely when you delete it from the dashboard. To remove one or more tiles from a dashboard, hover your mouse over a tile and click on its checkmark. When you select a tile’s checkmark, Discover displays a grey box around that tile. Select any additional tiles that you wish to delete. Once you have chosen the tiles you wish to delete, choose Delete Selected. Discover then displays a dialog box to confirm that you want to delete the selected content. 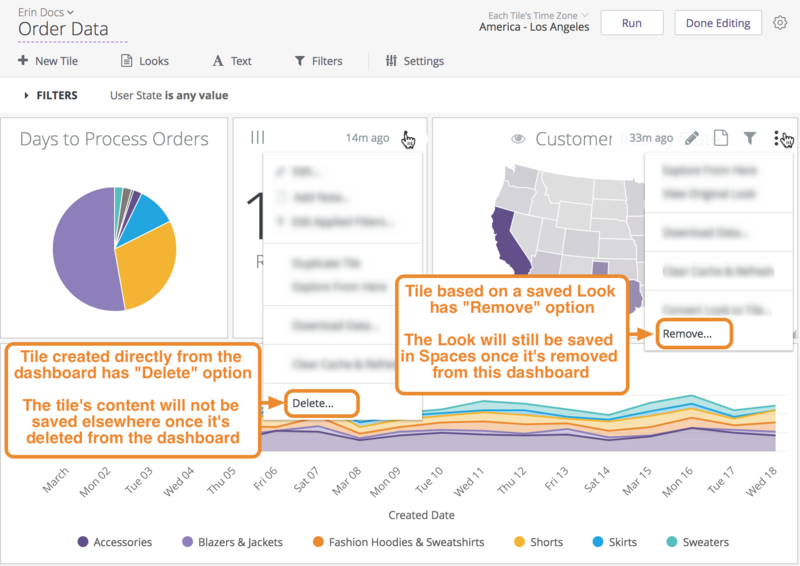 If you remove a Look-linked tile from a dashboard, the Look will still exist in any other places to which it is saved. Removing a query tile or text tile from a dashboard, however, permanently deletes that tile. 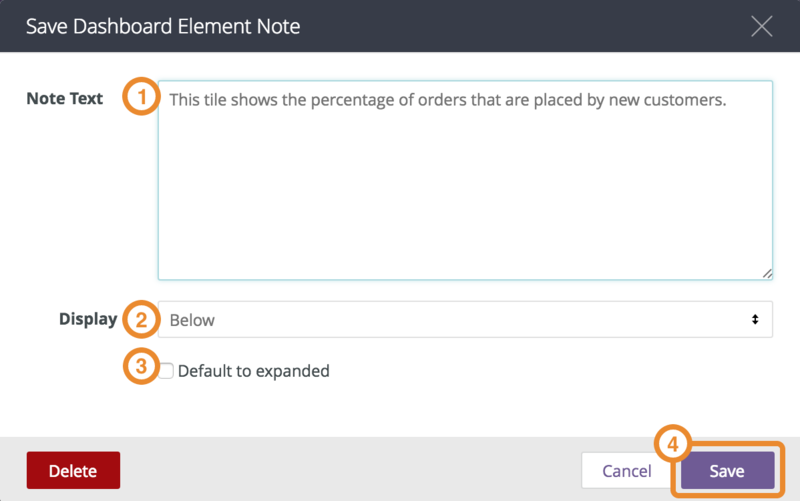 The Title that you assign in this interface will be displayed both at the top of the dashboard, and in the Space that the dashboard is saved into. The Description can be any text you want. The description appears below dashboards on the Spaces page. This option will only be available if you imported your dashboard from LookML. Under the Layout drop-down menu, drag must be enabled in order to drag and drop tiles. A message will prompt this change if the dashboard has recently been imported from a LookML dashboard. Any dashboard created through the UI is already in drag layout. If Run On Load is set to On, each element on the dashboard will automatically run when the page is first loaded. If Run On Load is set to On and there are no dashboard filters in place, the Run button will not appear. If Run On Load is set to Off, each element will show up when the page loads, but will not display any information until the Run button is pressed. If the dashboard filters are blank or invalid, or if the dashboard does not contain any tiles, the Run button will be grayed out. If the dashboard will be on display, it might make sense to refresh the data regularly to ensure up-to-date statistics. 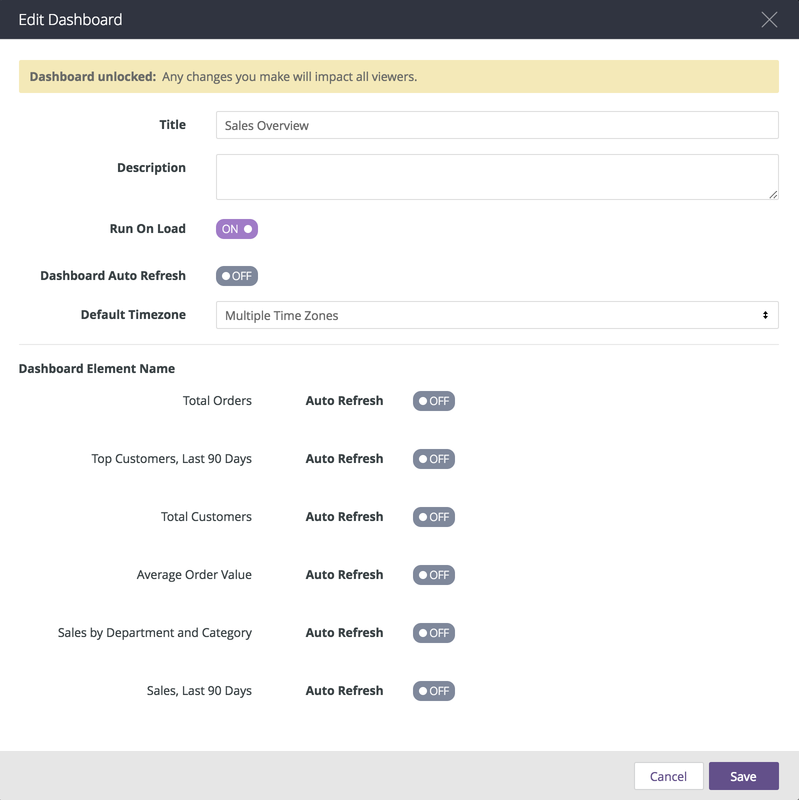 To do this, switch Dashboard Auto Refresh to On, then select how frequently you would like the entire dashboard to be reloaded from the database. The auto refresh intervals begin at the time of day that you turn on this feature. For example, if you set a daily refresh at 8:33 a.m., the next refresh will occur the next day at 8:33 a.m. The dashboard will refresh on the interval you set as long as the dashboard is open in a browser tab. If the dashboard is closed during a normal refresh time it won’t refresh until the next time it is opened. Refreshes never use the Discover cache; they always pull their data from the database. Frequent dashboard updates, especially on large dashboards, can place a significant strain on some database systems. You may wish to discuss this consideration with one of your Discover admins. At minimum, avoid setting a refresh interval that is shorter than your database update interval, because there is no new data to refresh and it creates unnecessary queries. Likewise, when multiple users access a dashboard with auto refresh, it may impede performance. If you would like to display your dashboard on a shared screen while multiple users simultaneously access it, you can create two identical dashboards and configure only the dashboard on the shared screen to refresh automatically. This option will only be available if your admin has enabled the User Specific Time Zonesetting. Select the time zone in which your dashboard will be run. Users will be able to change the time zone setting when viewing the dashboard. Each Tile’s Time Zone to have all tiles run in the time zone in which they were saved. Viewer Time Zone to have all tiles run in your user’s dashboard setting. Specific Time Zone: Select the specific time zone from list in the drop-down menu to have all the tiles run in that time zone. If you only want some rather than all elements to refresh, you can switch Refresh to On next to each element and define its refresh time. 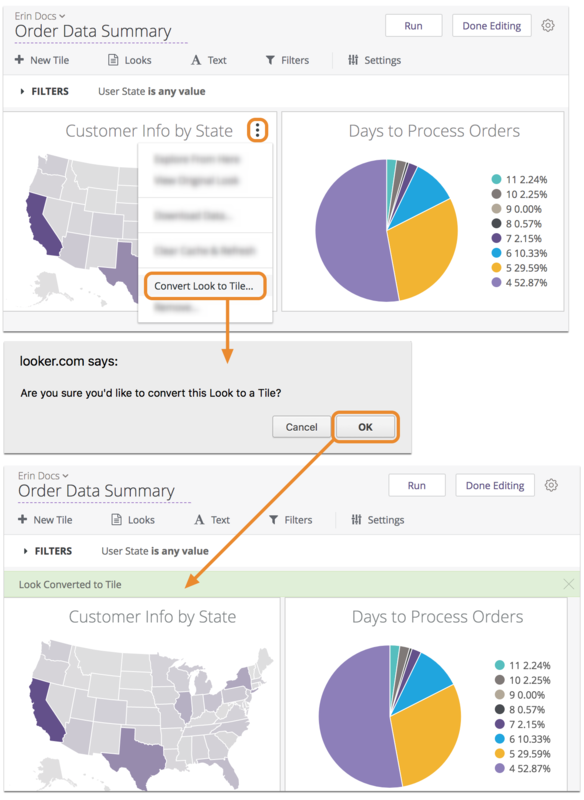 A dashboard tile can be created by linking to a saved Look (Look-linked), specifying text, or by specifying a query directly. 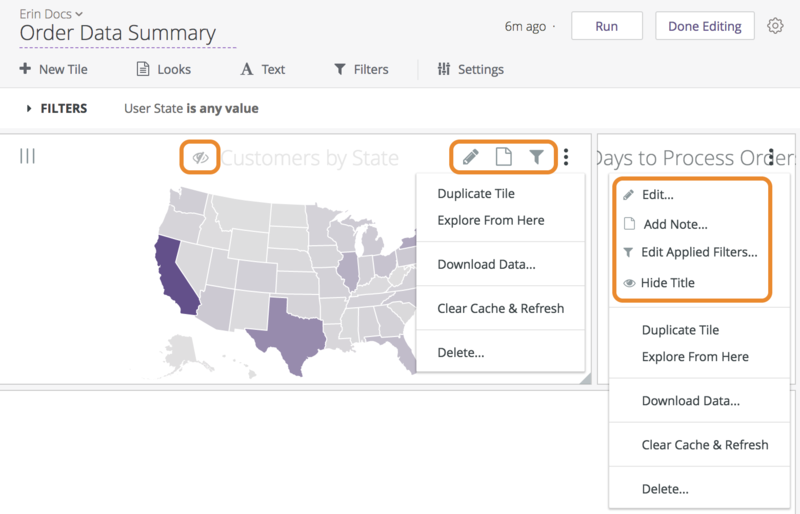 In Spaces, you can select one or more dashboards and convert all of its tiles based on saved Looks to query tiles. If your dashboard has tiles that are based on saved Looks, you can convert them to query-based tiles. You can convert a single tile at a time, or you can convert all of a dashboard’s tiles at once. The Look-linked tile is replaced by a new tile that uses the same query and visualization settings. If you change your mind, you can link the Look back in as a tile, as long as the Look is still saved in a Space. If you don’t want the Look, you might consider deleting the Look. You can also use the dashboard menu to convert all the dashboard’s Look-linked tiles to query tiles in a single operation. 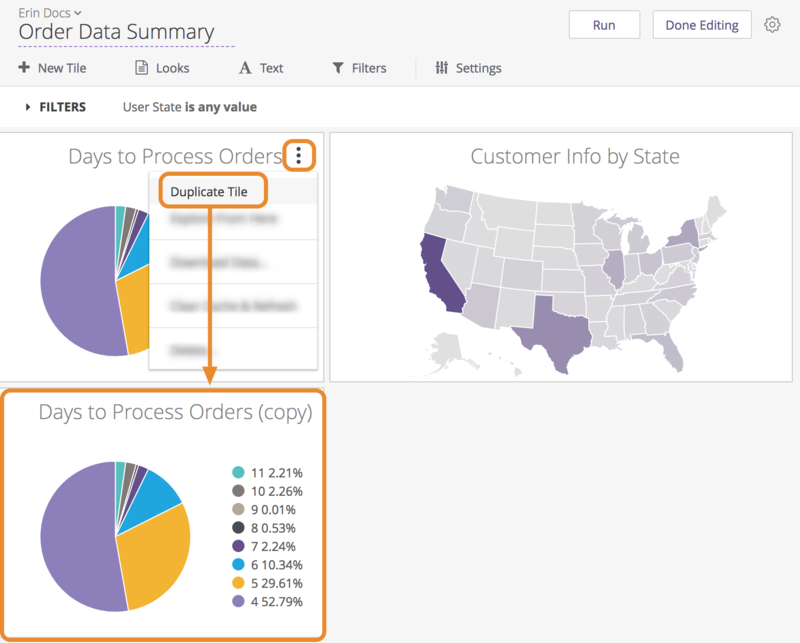 You can also convert multiple dashboards at once, as described on this page. Are not used in another dashboard. Have not been marked as a favorite. Have not been scheduled for delivery. Have not been made public. You can see which Looks will be deleted before deciding, as shown in the procedure below. Make sure the dashboard is in edit mode, then select Convert Looks to Tiles from the dashboard gear menu. In the Convert window, hover over the link to see the list of Looks that have been identified for deletion. The link is shown only if Discover has found Looks that can be deleted safely — that is, none of the Looks in the dashboards are scheduled for data delivery, used in other dashboards, favorited, or have been made public. If you don’t see the link, that means that Discover hasn’t identified any Looks that can be deleted safely. The Clean up Space during conversion option only appears if Discover has identified Looks that can be deleted safely. If you want to prevent Discover from deleting the Looks, uncheck the box. If the box is unchecked, Discover will keep all of the Looks but you can later delete them manually if you want to clean up your Space. Click Convert to convert all the of dashboard’s Look-linked tiles to query tiles. Discover then replaces each of the dashboard’s Look-linked tiles with a new query tile that uses the same query and visualization settings as the original Look. If you enabled Clean up Space during conversion, the converted Looks listed in the window will no longer be seen in Spaces. If you realize you need a deleted Look, your Discover admin might be able to recover it for you, as long as your Discover admin team has not already emptied Discover's trash as part of their maintenance process. You can delete multiple dashboards at a time from Spaces, as described on this page. When checked, the Clean up Space during conversion option will delete any Looks associated with the dashboard you’re deleting. However, Discover will only do so if the Looks are not scheduled for data delivery, not used in other dashboards, not favorited, and have not been made public. You can hover over the link at the bottom of the confirmation window to see the list of Looks that have been identified for deletion. If you don’t see the Clean up Space during conversion option it’s because Discover hasn’t identified any Looks that can be deleted safely. Click OK in the confirmation window to delete the dashboard. If you accidentally delete a dashboard, your Discover admin might be able to recover it for you. Discover stores deleted content in the trash until your Discover admin team empties the trash as part of their maintenance process.